Disclaimer...although I made paragraph breaks to separate parts in here, they are not showing up, so it's one looong babble :) March 16th - 9pm - A year has come and gone, and it's hard to believe that we are here again....in March...watching the clock tick by, remembering this night like it was just 4 years ago. It's hard to believe that that much time has passed yet it feels like a lifetime ago that B was here with us. THAT is a very unsettling feeling. I feared the day when the memories wouldn't be as crisp, as clear, as fresh...and here I sit writing and having that foggy sense of my memory rattling me, gnawing at me, reminding me that as time passes it is allowing those images to fade. It makes me angry, sad, and frustrated. So, where has exactly this year gone....??? Let's do a quick review of where we left off last year: --Well, I became a Sales Director in Mary Kay on April 1st and resigned from my teaching position in June. Crazy, I know, but as I often tell people...you never know where life is going to take you. I feel blessed to be able to do the things with Owen (and now Annika) now that I can create my own schedule. --Owen is going to preschool now and loving it. He is our little sponge, very inquisitive & watching every move we make - we are extra cautious (or try to be) on what we say and do. He still LOVES to dance and lipsinc to his favorite songs. It's entertaining to watch especially when he thinks no one is watching. He is our constant entertainment, stubborn like his dad & a bit sensitive like his mom. He makes our heart sing!!! --Heart of Gold Charity once again had an amazing golf outing fundraiser back in August. Although our attendance was a little lower this year, we were blessed to have raised over $23,000. Last year we gave over 140 gift bags to the hospital for new heart patients - this is 40 more than the average 100 bags we've given every year. We will soon be selecting our 2013 scholarship recipients to be announced at each school's award's night this spring. Mark your calendars as this year's golf outing will be on Saturday, August 3rd! --In December I attended a woman's retreat and was asked to give my testimony. I was able to speak to a group of women about my journey with grief & rebuilding my faith in God. It was an honor to get to do this, and another pull in the direction to where I think God is calling me....to write a book about my journey. 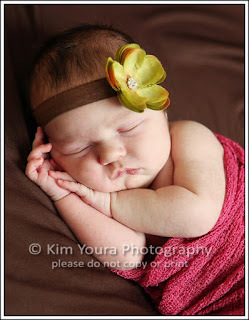 --And it will be four weeks already on Tuesday that we were able to welcome our new little bundle of joy, Annika Ruth. Her life, just like any child, has truly been a gift. 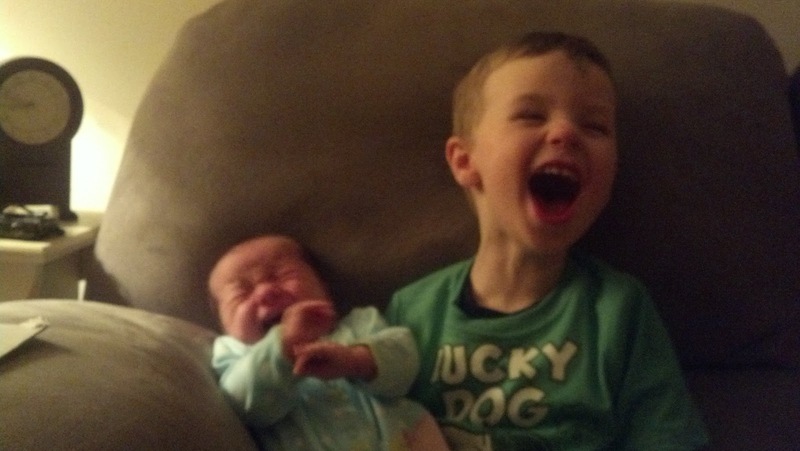 I know B is watching over her, and big brother Owen is finally starting to warm up to her. He is asking to hold her now - quite a change since asking if the doctors were going to come and take her back :) With Annika's birth came many bittersweet moments. I was actually induced & brought in the night before to start the process. I looked around the room & immediately I felt that pang of anxiety. So many good yet scary moments in these birthing rooms. I felt like I could go back to the moment Braden was born. I held him long enough to take a picture and they whisked him away to be monitored...who knew 2 days later we would be given the news that would forever change our lives. Although we knew Annika's heart was a-okay, there was still that anxiety over the "what ifs". 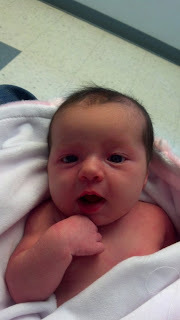 Well, the day that we were discharged the day nurse came in to introduce herself. When she left I told Rich she looked familiar, and we wondered if she was one of Braden's nurses (we never did see any of B's nurses when we were there when Owen was born). We asked her if she was B's nurse and immediately her eyes welled up with tears. She sat down and explained to us that in her 18 years of nursing the hardest day of her career was the day he was transferred and they later found out about his heart condition. She was actually the one responsible for getting the ball rolling for him to be transferred to another hospital. I will spare the rest of the details - one being that gut feeling we had felt with the doctor on call (he was a substitute & no longer works there) & our reservation with delivering there again when it was time for Owen's birth. There were tears shed & welcomed hugs that provided some closure for her and us that day. They have new protocols now with babies to ensure that the same thing doesn't happen (a sever heart defect going unnoticed at birth). This nurse also mentioned how she followed B's progress & life through our blog & charity site. She went on to say that she has been pursuing her masters degree, so she can teach nurses - B's life made quite an impact on hers. Talk about divine intervention and reminding us of how B's life has served & continues to serve many purposes here on earth. I walked away a very proud mama that morning!!! So, the year in review has been quite busy and very fulfilling, allowing us to focus on the many blessings in our lives. With that focus, I feel like I'm leaving someone behind. I know in true reality that I'm not, but with losing a child comes many conflicting moments when you feel, "I'm darned if I do/I'm darned if I don't." Although I have more peace in my heart these days, I still ask myself how that is even possible with this kind of loss in one's life....like my heart continues to play this tug of war. One minute I can be laughing with Owen and enjoying the moment of the 3 year old-isms and then I hear a song that can bring me to my knees sobbing for the life I will never lead - with 2 boys, Owen having a brother here on earth, having 3 kiddos, living a life of chaos...always wishing for one more day. Until recently, I really never evaluated how far I've come on my journey. Sadly one of my dear & closest friends lost her little girl just before Christmas. It was very sudden & still really no answers as to how & why. I sit & watch my friend go through the very painful, gut wrenching grief that I once had to endure...the kind of pain that could literally kill someone b/c of how physically & emotionally untolerable it is. I see her now, back at that place I was just 4 years ago hating that new life that we didn't ask for, where we would give anything just to have a moment of that old life back so we could see, hold, & smell our kiddos again. Grief...death...it's a process....a long process that is still so hard to understand. It feels so unfair to watch another person, especially a friend, have to walk this long & confusing road. This Pink song, Beam Me Up, pretty much sums up my heart & what it speaks today & everyday... http://www.youtube.com/watch?v=PFYm9LKsuUo (youtube video) The following part of the song reminds me of how often we see hawks in our day & how I continue to whisper "Hello B" everytime I see one :) Saw a blackbird soarin' in the sky, Barely a breath I caught one last sight Tell me that was you sayin' goodbye, There are times I feel the shiver and cold, It only happens when I'm on my own, That's how you tell me I'm not alone Could you beam me up, Give me a minute, I don't know what I'd say in it I'd probably just stare, happy just to be there, holding your face Beam me up, Let me be lighter, I'm tired of being a fighter, I think a minute's enough, Just beam me up. I will leave you with a few pics to end this post. One is Annika at one week old (the professional one with Kim), another at 2 weeks old visiting the doctor, and the other pic is not very clear but one of my favs that I snapped with my phone. Owen is asking to hold "baby sistow" at night and starts to laugh when she cries....he asks..."Why she cwy all da time?" "The best and most beautiful things cannot be seen or even touched, they must be felt with the heart." 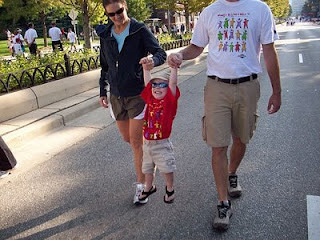 This last pic is of B at one of the Briggs and Al Walks. It's one of my favorite pics of him. It reminds me of how happy & joyful he must be in heaven....reminding me not to be sad. Amazing post. Your words are so beautifully written. Thinking of, and praying for you, Rich, and your families. Steph, you express yourself so perfectly. Thank you for sharing your feelings. You paint a picture with your words, that allows all of us to feel the emotion inside of you. May God bless the Petska family! Thank you for sharing your feelings...you write so wonderfully I think you should do that book, it will be great! I know I will want one! I was touched to read about the nurse that shared her story of Braden's birth. That is such a awesome God moment, how many more will you learn about when your story and his is re-told in paradise! I pray those moments continue to bless you and make your cross a little lighter each and every time. Take hope and comfort in all the promises that Easter brings. I love you and your sweet family. I love that you have not grown bitter, but have used your pain to help others. Sending you my love and wishing comfort and peace for you today. Thanks for sharing your heart Steph. It is read with joy and sadness. You're an amazing mom. I have been watching for your post, and it led me back to older posts of yours... your feelings as you moved through these past years always bring me to tears. The loss is SO MUCH. There is just no bottom...and yet you stay afloat somehow. Your strength is amazing. Love to you sweet Steph, B is not forgotten. We remember. Stephanie, Your journey made me cry. I pray God redeems every ounce of tragedy and continues to use little Braden in powerful ways to touch and heal others' hearts. I pray your heart is filled with God's love and hope as he continues to heal it.